Here is a front view video of the new Stoosbahn funicular railway from Hintere Schlattli in the municipality of Schwyz up to the village and mountain resort of Stoos, above Morschach. It's so steep (over 100% grade!) 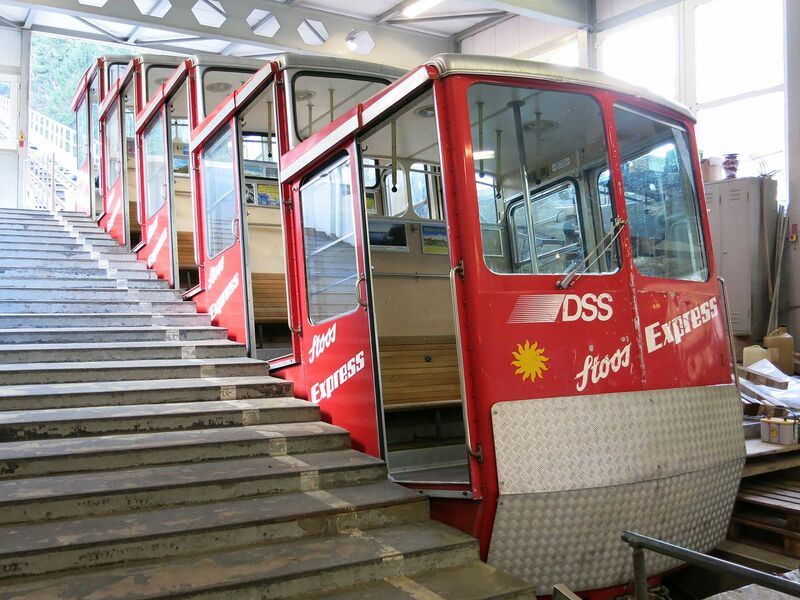 that they had to design a special railcar where parts of the train rotate to keep a flat level inside the cabins. 100% means a 45 degree track, not very impressing considering many funiculars runs at around the same gradient. What's unusual is that they have the terminals with the track parallel to the ground (grade 0), while the main line is at 45; this means that the gradient of the track changes during the travel, therefore the cabins need to adapt to the new gradient, while standard funiculars maintain an equal gradient on all the track. the cars and the terminuses for much, much less. Well, yes, but if being sensible does not give you a cool video in YouTube and lots of publicity. I believe at some points on the this line, the gradient is 110%, the highest in the world for a funicular railway that is used for regular commuter services (the Katoomba Scenic World Railway in Australia is a tourist-only ride).